Original Silver Gelatin Print, c. 1904, 9 " x 7 "
"I've always found him interesting," gallery owner Mark Sublette says about Geronimo. "I think he's probably the most photographed, iconic Native American ever." All over the world, his name is known...at least the one that he was reportedly given by Mexican soldiers who fought against him and Cochise, and who beseeched St. Jerome - their cries being twisted into the name "Geronimo" - to save them from the Apaches, Born Goyathlay in Turkey Creek, Arizona, he lived from 1829 until 1909, making this the centennial of his death. By all accounts, he was a venerable adversary for both Mexican and American armies, but he also was a husband and father, and late in life, something of a curiosity. "Everybody wanted to photograph Geronimo," Sublette says. "A lot of the images I have dispel the image of him as this fierce warrior with a gun in his hand. We do have some of those kinds of shots that Camillius Fly, who was a famous photographer in Tombstone took, but we also have photos of him in prison." 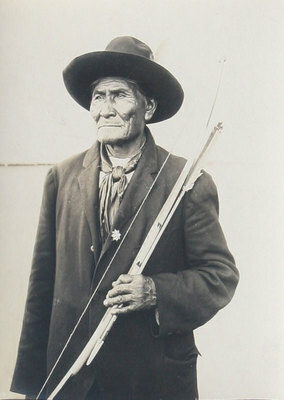 Geronimo was a prisoner of war for more than two decades, and ultimately ended up dying at Fort Sill, Oklahoma. The exhibition regarding the famous Apache leader will include everything from vintage photos - probably the largest collection on him ever offered for sale at one time - to contemporary artwork about Geronimo created just for the show, to pop memorabilia such as movie posters. Oddly enough it was the movies that lead to the name "Geronimo" being associated with a death-defying leap. In 1940 a paratrooper at Fort Benning making a jump from an airplane, copied a scene from the 1939 film Geronimo of the Apache leader yelling his name as he made a diving escape from pursuers into a river. The tradition stuck, and today has made in into our common vocabulary.